“Local artist Sarah King is pleased to present her first solo exhibition, giving you a taste of the landscapes that inspire her. These include holidays to the Jurassic Coast, her childhood home county of Suffollk, as well as her local surroundings in Leicestershire. Sarah has developed her own style over the years, of layering collaged textures before adding fine details. Texture, colour and patterns are themes that run through Sarah’s work, be it in the boats moored in the seaweed strewn Cobb harbour at Lyme Regis or in the muddy river Deben in Woodbridge. 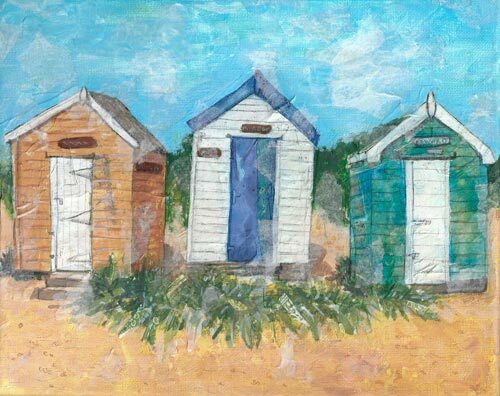 She’s inspired by the decaying wooden beach huts decorating the shoreline in Southwold and Seaton and by the historic buildings hidden in plain sight along the urban streets.